The 21st century seems to be on the move, perhaps even more so than the last. With cheap travel, and more than two billion cars projected worldwide for 2030. And yet, all this mobility is happening incredibly unevenly, at different paces and intensities, with varying impacts and consequences to the extent that life on the move might be actually quite difficult to sustain environmentally, socially and ethically. As a result 'mobility' has become a keyword of the social sciences; delineating a new domain of concepts, approaches, methodologies and techniques which seek to understand the character and quality of these trends. This Handbook explores and critically evaluates the debates, approaches, controversies and methodologies, inherent to this rapidly expanding discipline. It brings together leading specialists from range of backgrounds and geographical regions to provide an authoritative and comprehensive overview of this field, conveying cutting edge research in an accessible way whilst giving detailed grounding in the evolution of past debates on mobilities. It illustrates disciplinary trends and pathways, from migration studies and transport history to communications research, featuring methodological innovations and developments and conceptual histories - from feminist theory to tourist studies. It explores the dominant figures of mobility, from children to soldiers and the mobility impaired; the disparate materialities of mobility such as flows of water and waste to the vectors of viruses; key infrastructures such as logistics systems to the informal services of megacity slums, and the important mobility events around which our world turns; from going on vacation to the commute, to the catastrophic disruption of mobility systems. The text is forward-thinking, projecting the future of mobilities as they might be lived, transformed and studied, and possibly, brought to an end. International in focus, the book transcends disciplinary and national boundaries to explore mobilities as they are understood from different perspectives, different fields, countries and standpoints. 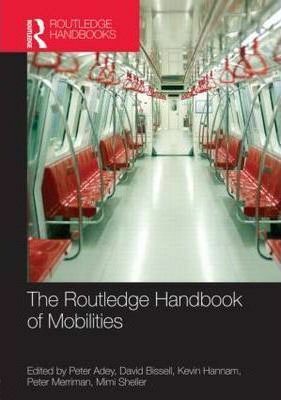 This is an invaluable resource for all those with an interest in mobility across disciplinary boundaries and areas of study. Peter Adey is Professor of Human Geography at Royal Holloway University of London. His research interests are located at the intersections of space, mobility and security and he is the author of several books including Mobility (Routledge, 2009). David Bissell is Senior Lecturer and Australian Research Council DECRA Fellow in the Research School of Social Sciences at the Australian National University. His research examines how different forms of travel, from international air travel to urban commuting, are generating new forms of subjectivity, new political formations and new sensory configurations of contemporary life. He is co-editor of Stillness in a Mobile World (Routledge, 2011). Kevin Hannam is Professor of Tourism Mobilities at Leeds Metropolitan University, UK and Visiting Senior Research Fellow at the University of Johannesburg, South Africa. With John Urry and Mimi Sheller he is a founding co-editor of the journal Mobilities. He is the co-author of the recent books Understanding Tourism and Tourism and India. He is currently collaborating on a research project on walking, art and landscape. Peter Merriman is Reader in Human Geography at Aberystwyth University. He is author of Mobility, Space and Culture (2012) and Driving Spaces (2007), and co-edited Geographies of Mobilities: Practices, Spaces, Subjects (2011) with Tim Cresswell. He is an Associate Editor of Transfers: Interdisciplinary Journal of Mobility Studies, and on the editorial board of Mobilities. Mimi Sheller is Professor of Sociology and Director of the Center for Mobilities Research and Policy at Drexel University. She is the author or editor of 7 books, including the forthcoming Aluminum Dreams: Lightness, Speed, Modernity (MIT Press, 2014). She is founding co-editor of the journal Mobilities and Associate Editor of Transfers.